Welcome to the official website of Dr. Kim Alexander. We thank you for your interest in our practice and hope our site can serve as an educational tool for proper oral hygiene. Patients trust Dr. Alexander as their local Greenwood dentist because of the family oriented atmosphere and experience with modern dental procedures. Some of our services include cleanings, fillings, sealants, implants, veneers, and teeth whitening. We also see kids as early as two years old. Dr. Alexander provides quality work that you can trust combined with affordability to give you a flawless smile. When you visit our Greenwood dental practice, patients will be treated with a relaxed environment and professional service. Our knowledeable and dedicated staff has been with the dentist and her practice for over 12 years, and strive to provide you with the personalized, gentle care that you deserve. 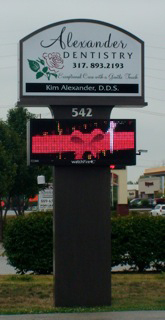 If you are looking for a dentist in Greenwood, IN that will take their time and not rush through an exam, Dr. Kim Alexander is exactly who you are looking for. Very patient, comforting, and honest, Dr. Alexander spends one-on-one time with each patient to establish a good rapport and to keep them informed on their oral health. Part of our commitment at Alexander Dentistry is to serve our patients information that helps them to make more informed decisions about their oral health needs. This website is a resource we hope you’ll find both useful and interesting. We also encourage you to visit our patient education videos which provide valuable information on dental procedures and treatment options. Dr. Alexander of Greenwood, IN focuses on general dentistry with services to your whole family including exams, whitening, veneers, cleanings, & more. Call 317-893-2193.